Marvin Dienst (HTP Junior Team) was unbeatable at Sachsenring. After he secured double pole position in yesterday’s qualifications and won in Race 1, Dienst was again victorious in Race 2 of ADAC F4 Championship and extended his lead in championship standings. It wasn’t easy, because he lost two places at the start against main championship rivals Joel Eriksson (Motopark) and Joey Mawson (Van Amersfoort Racing). But Eriksson and Mawson wasn’t able to follow Dienst’s furious pace and at the end their positions were as on the start – Dienst was 1st, Eriksson 2nd and Mawson 3rd. Start of the race was postponed because of problems with kerbs on the track. 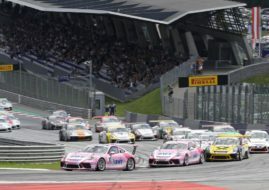 Very soon after the start, the race was stopped by Safety Car and than red flagged. The reason was a triple crash of Mick Schumacher (Van Amersfoort Racing), Marek Böckmann (Jenzer Motorsport) and Janneau Esmeijer (HTP Junior Team), so marshals had to clean lots of debris. After the restart there was one more Safety Car outing in Lap 7 after Cedric Piro crashed. Behind the leading trio, there were just a few changes of positions, but without dramas and big excitements, so everybody safely arrived to the finish. Other point finishers are Kim Luis Schramm (Neuhauser Racing), David Beckmann (Mücke Motorsport), Tim Zimmermann (Neuhauser Racing), Robert Shwartzman (Mücke Motorsport), Jason Kremer (Team Scheider), Michael Waldherr (Motopark) and Harrison Newey (Van Amersfoort Racing). After 17 races and 7 victories Marvin Dienst has 244 points, 24 more than second placed Joel Eriksson. Joey Mawson collected 200 points, 59 more than fourth placed Robert Shwartzman. Third race at Sachsenring is scheduled for tomorrow at 16.15. Due to reversed grid of Top 10 drivers from Race 2, starters from first row of the grid will be Harrison Newey and Michael Waldherr.